‘Tis the season for warming, soothing soup; this one is great because squash’s creamy base requires no heavy-handed enhancement. Two shopping lists, one from the local market and the other in the form ingredients you may have in your pantry, make it easy to assemble. 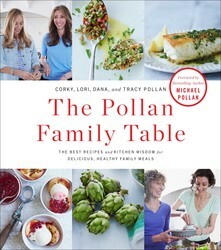 From The Pollan Family Table: The Best Recipes and Kitchen Wisdom for Delicious, Healthy Family Meals. 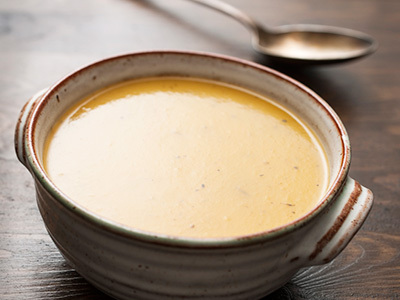 On a chilly fall evening, nothing beats a warm bowl of butternut squash soup. The toasted pumpkin seeds and balsamic vinegar ramp up the flavor, and because of the smooth, buttery texture of the squash, there is no need to add heavy cream. Spread the pumpkin seeds across a rimmed baking sheet in a single layer and spray lightly with the cooking oil. Sprinkle with sea salt and pepper. Bake until lightly toasted, about 10 minutes. Remove from the oven and set aside to cool. In a large stockpot over medium heat, melt the butter. Add the onion and carrots and sauté until they begin to soften, about 5 minutes. Add the garlic and ginger and stir for 30 seconds. Add the butternut squash and cook, stirring frequently, for 5 minutes. Pour in the vegetable broth and bring to a boil. Reduce the heat to low and cook uncovered, stirring occasionally, until the vegetables are soft, 15 to 20 minutes. Return the soup to the heat and add the nutmeg, 2 teaspoons of kosher salt, and black pepper to taste. Stir to blend well and simmer until hot. Ladle the soup into individual bowls and top each serving with 1 teaspoon of the toasted pump¬kin seeds. Add a swirl of balsamic vinegar glaze, ⅛ to ¼ teaspoon for each bowl, and serve.